Harold & Kumar are our new Cheech & Chong. That isn’t an original thought, but considering that we have so many weed-smoking characters onscreen nowadays, it’s not all that special to be tokin’ and blowin’ smoke in the face of The Man anymore. I mean, most people want marijuana legalized now. It’s not taboo like it used to be. Smoking weed isn’t all that funny as it might have been once upon a time, either. I thought the first movie was pretty funny, and the second one pretty much missed its mark. Dumb comedies where anything goes, I usually can get on board with that. The Guantanamo Bay chapter was too big for such a small premise, although it had its moments. In this mocking-3D-while-being-3D-and-taking-the-3D-money holiday chapter of Harold & Kumar, Harold (John Cho) is married to his sweetheart Maria (Paula Garces), but is having to deal with her family coming to their house for Christmas, with scary father (Danny Trejo), racist against Koreans for some reason in tow. Harold is trying to grow up, he’s pretty much left his friend Kumar (Kal Penn) behind, who is still in the throes of arrested development. Kumar’s girlfriend is pregnant, but she drops the bomb on him when he’s high, so he’s not ready for the news and she walks out on him. Kumar gets a gift addressed to Harold at his apartment, so he seeks out his old friend to give it to him. The two have unsuccessfully tried to latch onto new friends: Harold with stuffy, uptight Todd (Thomas Lennon), and Kumar with nerdy Adrian (Amir Blumenfeld of College Humor’s Jake & Amir), who wants to nail a hot virgin he met online. 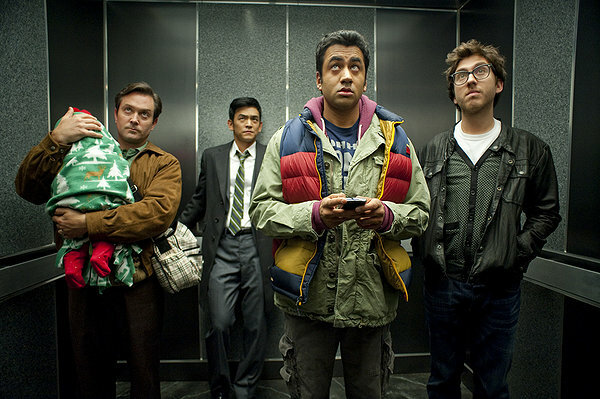 Harold wants to impress Maria’s Christmas-obsessed dad by decorating a tree while the Perez family hits New York City for the evening, but Kumar comes by and destroys the tree, and thus begins the “search for the tree on Christmas Eve” that leads Harold and Kumar into another adventure. In this, they have to find a tree and decorate it so Maria’s dad will be impressed, dodge Russian gangsters, and once again run into Neil Patrick Harris, who is absolutely the best thing about this movie. It’s where a sorta, kinda funny movie starts to really kick in. Harris has used the hyper-cad persona he invented for the original Harold & Kumar Go To White Castle to land How I Met Your Mother, which then led to him “coming out” a few years ago. It’s hilarious how Harris uses both sides of his “real” self here in this movie, the first time the series acknowledges him being gay leads to the funniest line of the movie and perhaps this year. After NPH makes his cameo, the movie starts to get a lot funnier. The 3D, by the way, is funny in its low-tech mockery of the form. It’s an irony, of course, that the movie makes fun of 3D but stands to gain more ticket money from being 3D. I think here 3D is used fairly well, in the comic manner that it’s presented. Obviously, it’s not needed to enjoy it, but I think it adds some daffiness to the already-looney flick. Overall, this is OK. It’s better than the last entry.